Wahso ranks in the top restaurants in Park City, year after year, due to its spectacular interior and unique Asian cuisine menu. Featuring Asian artifacts from around the world, Wahso is modeled in an Art Deco style, that reflects Shanghai from the 1930's. It is truly unlike any other restaurant, and dining there will transport you far from the world outside on Main Street. and attentive service call back the Jazz-era Orient. Our cuisine itself combines elements of different culinary traditions, and we proudly prepare Pan-Asian ingredients. We make twists on classic flavors help us to create innovative and delicious cuisine, unlike anywhere else. Although we specialize in Asian food, we have something for everyone in your group at Wahso. Our Chefs are here for you, and we are able to meet any dietary needs, such as Gluten Free, Vegan, Vegetarian, etc. Just be sure to indicate on your reservation! Our namesake, Wahso, comes from the phonetic spelling of "bird" in French (oiseau). 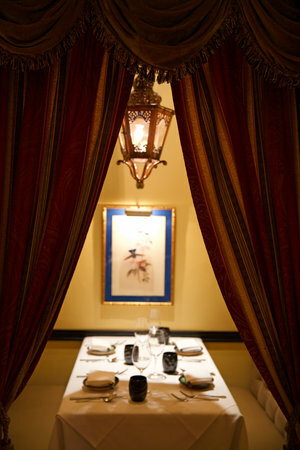 Our vintage Shanghai inspired interiors, lend to our cuisine by creating an ambiance that will transport you. In fact, our owner, Bill White, collected artifacts from around the world to build the restaurant layout around. Including a 1,000 lb, 500-year-old Tiger statue from the Ming Dynasty, teak columns from India, mahogany doors from Tibet, chandeliers from Turkey, and beautiful artwork adorning the walls from all over Asia. Catering + Events are opportunities for us to work more closely with our guests. Special occasions allow us to share our dedication to celebration with you. For more information about Sundance, weddings or group reservations, please visit our Reservations Page to contact our Events Team.